C&C Amnesia is going to change the roots of C&C. Base Construction is no longer the primary aspect of the game and can only be done by capturing pre-placed construction yards on the map. To conquer, you have to command the almighty Redeemer. This walker is designed for conquering. The Redeemer comes with a long range Capture Laser Beam and will capture (or 'Permanent control') everything that crosses in its path. Not only the beam will capture everything by single hit, it will also severely damage anything close by. This will make command and conquering a slight more of a challenge. Next to the Capture Laser Beam, the Redeemer is equipped with a Chaos Control Node. This control node can be activated when the Redeemer will be 'deployed'. Surrounding units will go berserk for a short amount of time. Last but not least; 'If I can't have it, I will just crush it'. Due the heavy weight and mechanical legs, the Redeemer can crush any vehicle on the battlefield. That's it for now. See you on the battlefield. It has been a while, but I have returned to the community. With this small message I would like you all to inform I have started a new project called C&C Amnesia. C&C Amnesia will be Yuri's Revenge mod featuring the ARES DLL expansion. If you find any irregularities on the website, please let me know by leaving a forum PM or a message in this topic. Soon i'll post more information about the concept of the mod. For now, enjoy the website and stay tuned for some more C&C Amnesia mod progress. 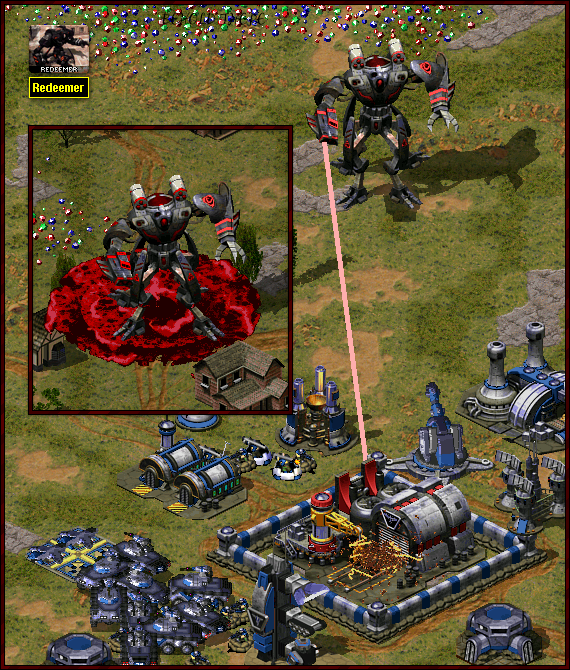 C&C Amnesia is a modification for Command & Conquer: Red Alert 2: Yuri's Revenge. The unique content in this mod can not be used in other mods. Unless permission granted.